Unit 1108 is a perfectly updated, luxurious 11th floor condo. From the entrance hall, you can see straight through the condo to your private, expansive, 11th floor balcony and the breathtaking gulf of Mexico. In addition to a dining table, your balcony includes a small sitting area for you to enjoy your afternoons. From your balcony, your view will stretch from the gulf all the way back over the lush greenery of the Destin resorts. The kitchen is fully equipped with breakfast bar. You will also find a washer and dryer for your up-most convenience. The master bedroom has a luxurious king size bed, flat screen HDTV, DVD player, and the master bathroom has beautiful tile work, a whirlpool tub, and a walk in shower. The second bedroom has bunk beds with a queen that pulls out. At The Tides @ Tops’l. If you’ve never made your way to Tops’l you don’t know what you’re missing. This place has everything. Beautiful beach. In fact rated best by Southern Living. And if you can’t trust them who can you trust. Incredible views. Close to golf. The Tides are part of Tops’l Beach & Racquet Resort which is smack dab in the middle of 52 beautifully landscaped acres bordered by the Gulf of Mexico and by Topsail Hill State Preserve. WOW! There’s 600 feet of private, sandy white beaches. There’s a ton of stuff to do here, with the daytime activities and nightlife of neighboring Sandestin and other noted communities to the west, and a nature preserve for quiet and solitude to the east. Tops'l provides the best of both worlds. At tides you will have many wonderful amenities such as free wireless internet, private, heated tides pool, community grills, basketball, putt-putt, nature trails, and many kids programs. Also, tops'l hill nature preserve is upon a national historic registry spot (next to beach manor on tops'l resort) where usa military tested captured German v2 buzz-bomb rockets there in 1944. And if that weren’t enough, Silver Sands Outlet Mall, one of the largest in the US, is less than 5 minutes away. Sandestin's popular Baytowne Wharf is just across the street to the west with shops, excellent restaurants and entertainment on the bay. Concerts on Wednesdays and family movies on Thursdays are popular family outings on the lawn at the Wharf. Sandestin's recently developed Grand Boulevard Town Center, nearby to the east, has upscale shopping and many excellent restaurant options. There’s so much to do here you won’t be able to fit it into a week’s vacation. So stay two! That’s what I’d do. You must be at least 25 years old to rent with us. This is a Gulf front building. Step out of the building and your feet are in the white sands. Great view and nice accommodations! Other than a few minor maintenance issues, the condo (1108) was GREAT! The food at the pool grill was excellent, and Lori (server) was FANTASTIC!! We would definitely stay here again. The only downside is checkout is at 10AM. Very clean and well appointed! I rent a property in this area at least once a year and this was the best equipped kitchen yet. Just one suggestion, needs more wins glasses. The owner was very nice and an easy person with whom to work. Would recommend this condo to anyone. Hello and thank you for your feedback. I will make sure to add more wine glasses next time I am down in Florida. We loved our unit 1108. It was clean when we arrived. The only thing I didn't like was the sleeper sofa. I think it was kind of bent and mattress was thin, but I guess they are all thin like that. Good thing k we brought memory foam pad to put on top. Unit also had chairs,umbrellas, and boogie board for the beach.The pool area was nice. Food at the bar was delicious. The short walk to beach was great. Beautiful emerald green water was the best part of our stay here! Kids also like the putt putt, although playing in the dark was kind of hard. They had no lights out there. We will definitely be back to Tops'l! First, let me say, that my family and I really enjoyed our stay in Tides Unit 1108. There were a few annoyances, but first the positive. 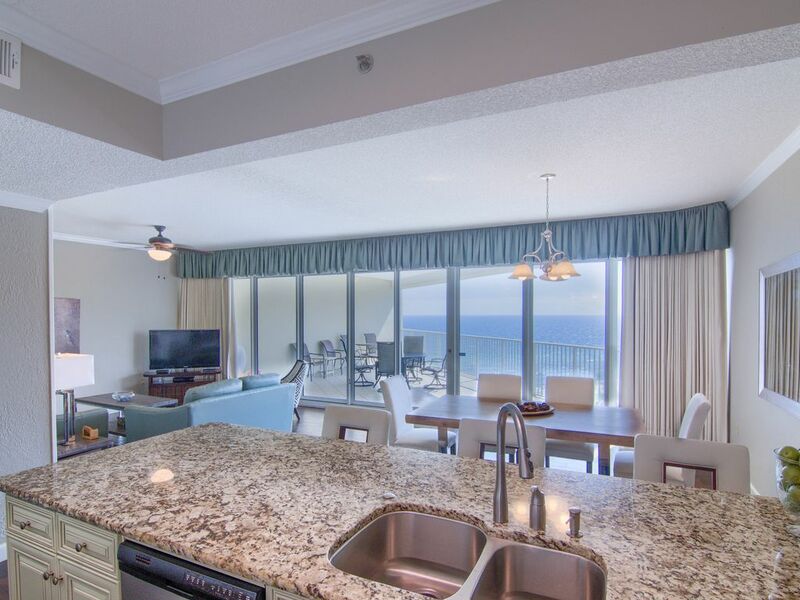 -From the balcony, the condo has a wonderful view of the gulf. The fireworks show put on by the Hilton next door was spectacular and the view allowed us to see every bit. -From the elevator, you will take a right and the unit will be the first one to the left. Close proximity to the elevator was nice. -The Unit is spacious with pretty much all the conveniences of home. There were plenty of storage dishes, cutting utensils, and baking pans in the kitchen. Didn't find an ice cream scoop, but wasn't a huge deal. -Unit was relatively clean with ample towels and washcloths provided. -We arrived early, around 1:30p, with official check-in time at 4:00p. We inquired with the guard whether we could be able to enter the unit and were told that if some status (unclear what they said) was noted in the system, and our parking pass was available, we should good to go. When got up to the room, probably 1:45 by this point, the cleaning crew's tools were still there and the unit was still unkempt. We put our things on the balcony out of the way and waited on the crew. Not sure where they went, but they didn't show back up until after 3:00. My wife went ahead to the store and I took the kiddos to the pool, but the cleaning crew, I believe, didn't actually finish cleaning until a little after 4:00p, past official check-in time. This was annoying as the perception at the guard shack was the unit would be ready, then the cleaning crew wasn't actually finished until after official check-in time. -3 light bulbs out in the fixture above the dining room table. 2 of 3 were able to be replaced. The last needed a new socket, which needed to be ordered. -One of the kitchen drawers was stuck but was able to be fixed. -The garbage disposal button was stuck rendering it inoperable. A part was replaced and the disposal worked for the remainder of the trip. -Sliding mirrored doors for the Master closet were difficult to operate. Maintenance noted it needed new rollers that would have to be ordered. Future renters shouldn't let the annoyances/issues deter them from Unit 1108. I'm sure all items will be addressed bringing the condo into tip-top shape.